The repaving of the Commissioner Street Overpass is part of the port authority’s multi-year pavement management program. The project consists of asphalt milling and paving, the removal and replacement of an existing asphalt waterproofing system, and the application of thermoplastic pavement markings to the Commissioner Street Overpass. 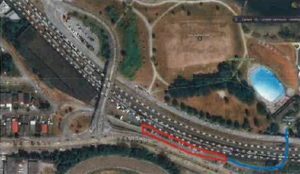 Construction update (June 29, 2018): Due to constraints caused by weather, work to repave the Commissioner Street overpass will continue through the week of July 2. Dependent on weather, we expect two-way traffic to resume by Friday, July 6. Monday to Friday – 7:00 a.m. to 10:00 p.m.
Saturday – 7:00 a.m. to 8:00 p.m.
Sunday – 10:00 a.m. to 8:00 p.m. There will be some noise from milling, waterproofing and removing debris. Light and noise impacts can be expected during evening shifts, and contractors will aim to minimize these impacts on neighbours by working as efficiently as possible. Portable lights will provide lighting for evening shifts, and we be faced east away from residences whenever possible. One sidewalk on the overpass will remain open. Pedestrians and cyclists will be able to use the sidewalks for east/west travel. Traffic management personnel will be available to ensure pedestrian and cyclist safety. Overpass usage for vehicles during construction: During construction, signage and flaggers will be in place. 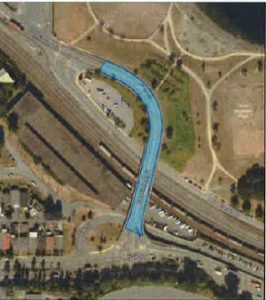 Drivers coming to New Brighton Park should park on Wall Street in the designated parking area shown in red. They can then follow the walking path marked in blue to enter the park. Drivers can exit directly onto McGill Street rather than being detoured to the Clark Street overpass. 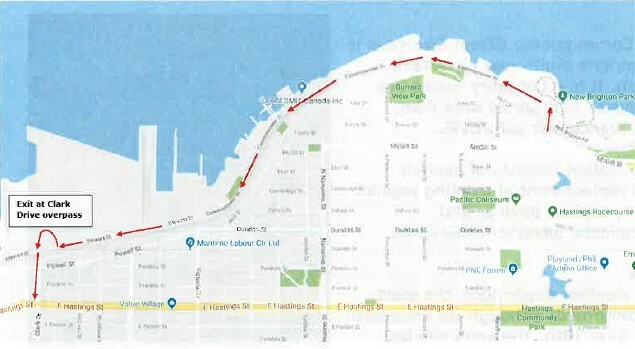 During construction, vehicles will only have single lane one-way access into the port northbound from McGill Street. Commissioner Street will be closed as an exit. The detour route will be west along Commissioner Street exiting out at Clark Drive. Exiting port lands will require passing through a vehicle access gate checkpoint. Drivers will be required to show a valid driver’s license.